This is my favorite dessert, whether I use apples, peaches, berries or pears. 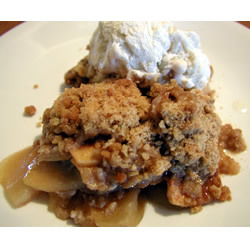 The pink lady apples are delightful in this crumble, sweet and slightly crisp. Use any fruit you like, about 3 pounds. You could even combine fruits as well. Position an oven rack in the center of the oven and heat to 350 degrees. Place apples in a large mixing bowl and toss with sugar, lemon juice, flour, and cinnamon. Pour into a 9 by 13-inch baking dish that has been lightly sprayed with cooking spray (I use canola or olive oil spray), and spread out into an even layer. Set aside. In another large bowl, mix together the nuts, flour, oats, sugar, cinnamon, nutmeg and salt for the topping. Using a pastry cutter or your fingers, gently work in the cold butter until pea-sized lumps are formed. Top apples evenly with mixture and bake until apples are bubbly and topping is golden brown, about 45 minutes, rotating once halfway through cooking.